Spirit of 76 opened for business for the Milwaukee area in April of 1980 in place of the old 76 gas station that occupied the site. Hence the origin of our name. The original staff was one kennel tech, one receptionist, one technician and the owner, Dr. Stan Thieman. 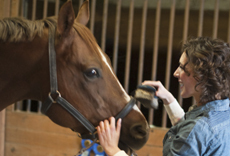 Over the years, thanks to our loyal clients and support from our community, Spirit has grown to be one of the top veterinary practices in southeastern Wisconsin. Both the staff and the building has grown to accommodate the the needs and wants of our clients. In 1999, a small addition was added to the west side of the building. In 2003 Dr. Thieman decided it was time to retire, Dr. Troy Semandel, a doctor working under him, took over his legend and bought the building and business from him. Shortly after, in 2007, the major addition was made to give more exam space, surgical capabilities, ultrasound, kennel area and office rooms. Since then, the clinic has grown to be a four doctor practice. We provide care in all aspects of your pets well being, including preventative health care, diagnostic imaging, surgery, ultrasound, orthopedics, internal medicine, behavior consultations and boarding. Spirits goals have always been to provide the best veterinary care, like our motto states, "we treat your pet like they're our own." which has stood the test of time! 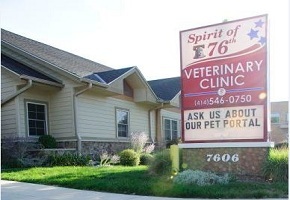 Spirit of 76 Veterinary Clinic will continue to grow along with the times to provide our community with the best, most up to date medical and surgical care for your pets.